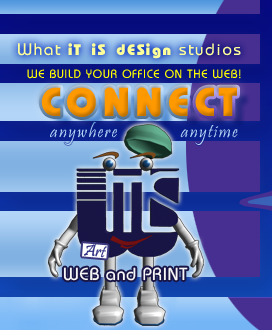 welcome to the web site development and print design studios of iTiSdESign! What iT iS dESign studios is headquartered in Muncie, Indiana, USA. Each custom Web site we create is as unique as a snowflake. Our design portfolio lists many satisfied businesses and organizations across the United States which profit daily from our affordable Web site and print design services. Open 7 days a week, we offer round-the-clock website maintenance and technical support. Welcome, we invite you to have a look around. Simply contact our design office if you have any questions. Enjoy your visit! From business card design to ecommerce development, we've delivered personalized services throughout the United States and internationally since 1998. Our print design portfolio includes billboard designs, book and membership directory covers, magazines, posters, letterhead, CD/DVD labels and logo designs. Our Web design and development portfolio includes banner ad systems, real estate locator tools, Microsoft SharePoint and Exchange integration, streaming video solutions via Adobe Flash Media Server 4, Flash animations, college recruitment tools, newsletter systems, PayPal Pro and Express Checkout integration, eBay Trading integration, Amazon Marketplace integration, document management systems, membership directory tools, and custom online stores and online offices. Nationwide we also utilize a network of affiliates to provide computer service, photography, and audio/video services to our Web site design and development clients.